Lots of both in the river and creeks around New Bern. More fins than feathers. ....these sports stepped on my boat with a saltwater fly rod. 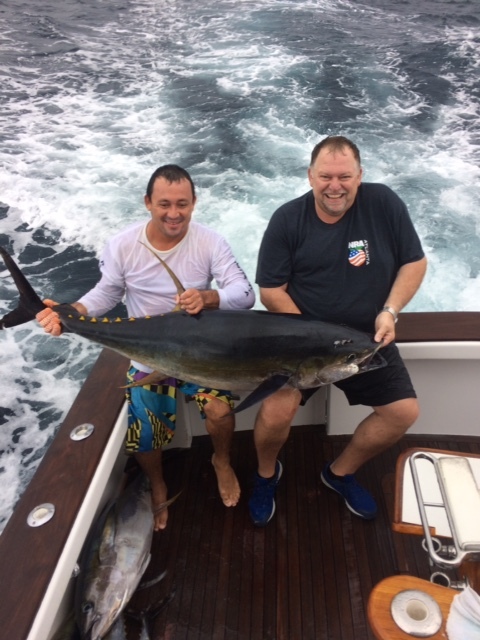 When they left they gave it to me, opening a can of worms that I have thoroughly enjoyed as I did spending some time on the water with Pete and Mo this week. wow, I am stuffed. Good stuff. When I retire maybe I'll open a restaurant. great action and calm conditions with the albies this morning, searched a while but found some bait and charge doffshore before the wind picked up to catch a nice limit of gag grouper. Beautiful day on the water with sw breeze warming things up for a nice ride home. ......and the trout showed up on the beach and at the jetty. Ray got on the stripers and trout today at New Bern. First day was a bit slow with just 3 nice tunas, but James got on a little bite on day two with a triple grand slam, 3 sails, 3 striped marlin and 4 blue marlin......not too shabbby. Scattered ablies on bait up and down the beach with more out on the draggers, sight casting drum in the suds and the king mackeral just off the beach is off the hook........after this nor'easter things should really fire off. Wow. Took a quick trip looking for a snappa and couldn't stay away from the groupers. Good problem to have. Put out one line out with a live bait and immediately got bit......repeatedly. Limit of gags and limit of kings in just a couple of hours. Road past plenty of albies. sounds like the drum and trout are biting in the suds. Looking forward to some of the great fishing we have right here!